Cooking is an amazing passion that can seriously improve one’s quality of life. Some might even argue that cooking is an art, which is understandable. But taking up cooking means investing time and money into learning and gear. A food dehydrator is, to some, uncharted territory. 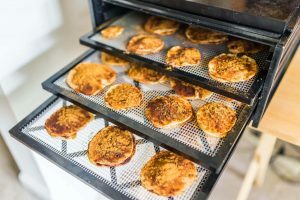 Let’s talk a bit about what can you do with a food dehydrator and how can you really bring up their cooking game with some awesome snacks and dishes. 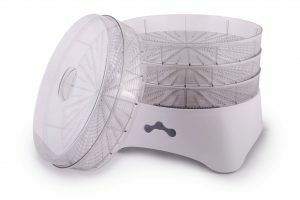 The dehydrator brings along with it a new concept of cooking. This isn’t because dehydrators are a new type of appliance, they’ve been around for a while, but because there’s an increased interest in a vegan and raw vegan lifestyle. 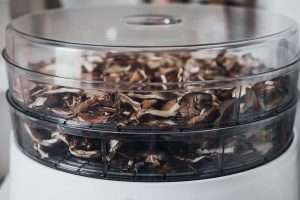 Vegans and raw vegans should find the dehydrator especially useful since it provides a great way to store and preserve food, as well as making healthy and delicious snacks. That being said, it’s not just for vegans, oh no. The dehydrator is great for making a lot of different foods, including jerky, cookies, bars, but more on that later. The way it works is pretty simple. It raises the temperature in the chamber at a point at which the living enzymes found in vegetables and fruits don’t die. Food dehydrators are simple in their concept. That being said, it doesn’t mean that there isn’t complexity or science going in their design. There are some main components that every dehydrator will use, which all play a big part in how the whole drying process plays out. First off, there is the heating element. Arguably the most important part of the food dehydrator, this element can usually keep temperatures as high as the boiling point of water. Generally, the consensus is that around 45 degrees Celsius are optimal for dehydration (113 Fahrenheit), since the temperature is high enough for water to evaporate but not enough for the living enzymes to die. 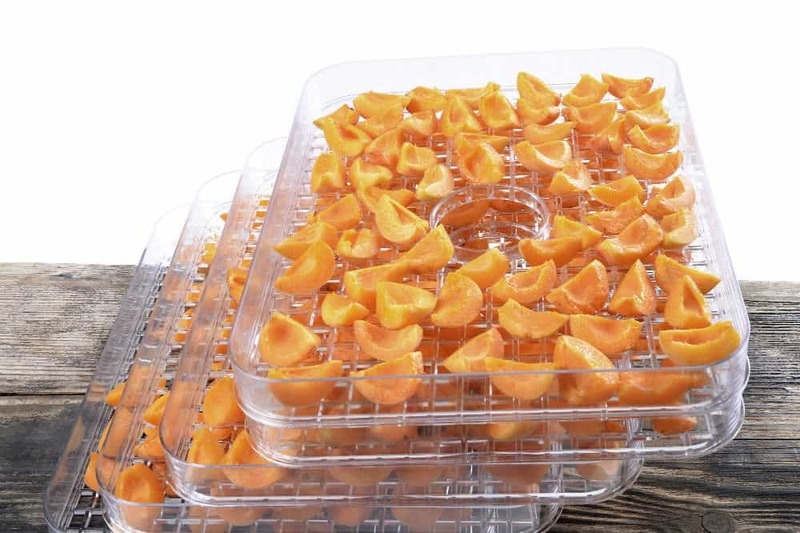 This will keep the food rich in vitamins and minerals as it dry out, making it a perfect way for storing excess products (like fruits, vegetables, meats) and turning them into crunchy or chewy delights. The trays and ventilation system contribute to keeping the dryness in the environment and on the products as low as possible, so that condensation won’t take place (something that would otherwise ruin the dehydration process). 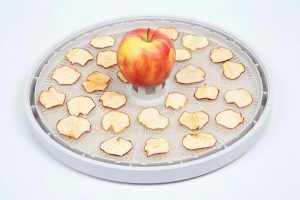 What Can You Do with a Food Dehydrator? 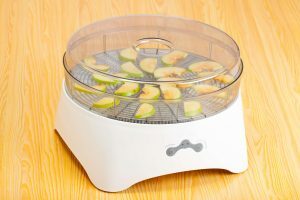 What’s really cool about food dehydrators is that, by nature, they’re very versatile and practical. They can be used to store foods over the winter, to make healthy, tasty snacks and to make ingredients for cakes and other types of dishes. 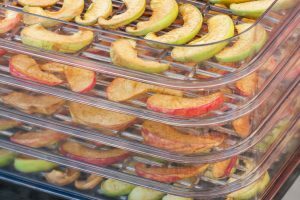 The possibilities are pretty much limited to how much time the user wants to invest in prepping the products and actually dehydrating them, since cycles can get pretty lengthy, depending on the food. 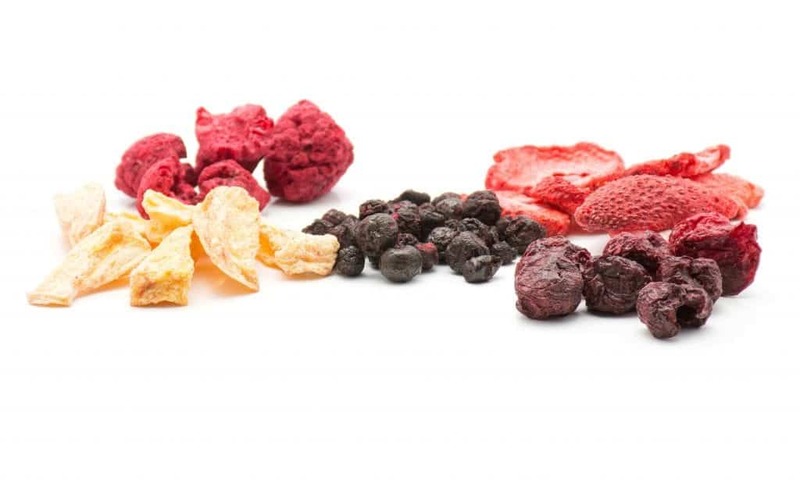 Probably the “crowd favorite,” making fruit and vegetable chips is a breeze when owning a food dehydrator. That being said, the process itself takes a lot from start to finish, and the user must be aware of the time investment required to finish such a snack. Apples and bananas are probably the go-to food when people think of fruit chips. They’re very easy to make and require little to no cooking experience to master. Simply take some basic spices, like cinnamon and sugar (white or brown) and drizzle them over the apple or banana slices. They should be placed on a dryer tray, in a single layer. Because they’re not very moist, using waxy paper lining is the way to go. Setting the temperature to around 135 degrees Fahrenheit is optimal for making apple chips since apples have a higher concentration of water and require more heat to dry properly. That being said, this isn’t the healthiest snack, with high sugar levels being its biggest drawback. A classic comfort snack, potato chips are great for parties, gatherings, or just for relaxing with a movie or a game after a busy week. Having a dehydrator can really bring new flavors to the classic, by adding the user’s own choice of oils and spices to the dish. 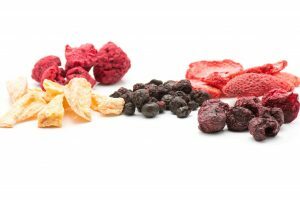 The process itself is very similar to that of making fruit chips; the only thing that differs is the ingredient and the slice size. Obviously, one would want to use a finer tool to slice the potatoes (even a potato peeler can work). The slices must then be placed on a single layer, salt to taste, and seasoned with the user’s choice of spices (smoked paprika chips are literally amazing). 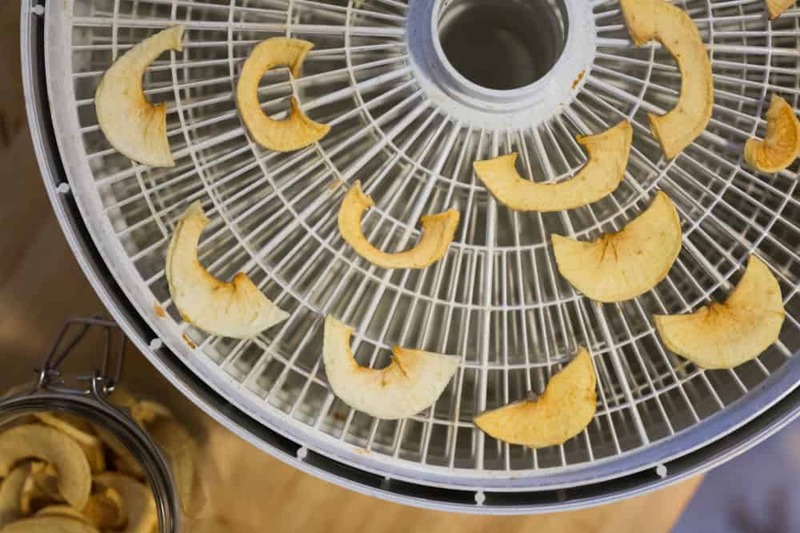 In six to eight hours, using a 135 F degree, a full dehydrators worth of chips can be ready for the whole family to enjoy. 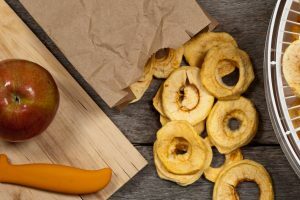 They’re crunchy, tasty, and all of the ingredients are controlled, making them a perfect go-to snack for the foody that also wants to stay healthy. As a snack, jerky is a bit of a “superfood,” because it packs a lot of protein and iron while keeping calories on the low side. Jerky is easy to make in a dehydrator since it only requires the user to cut the beef into thin strips and add their preference of spices. However, you need to be creative in choosing the right beef and the right mix of ingredients to go with it. Because everything will be dried up, it’s best to avoid using fat parts of the cow and marinated beef. There’s a problem with making jerky in a dehydrator, though. The power setting must be cranked up to the max, and depending on the blend of spices, it can get a bit smelly. Because of this, it is highly recommended to use stainless steel trays and mesh linings, since they will retain little to no smell. Lingering odors can really affect the taste of other future batches. There is no wrong way of using a dehydrator! 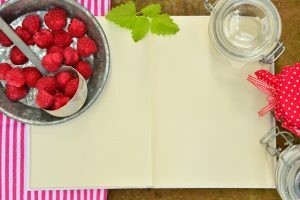 The internet is filled with recipes, from raw vegan to yogurt and dry meats, every person can find the right choice of snack or dish. The only thing required to master the secrets of the dehydrator is time. 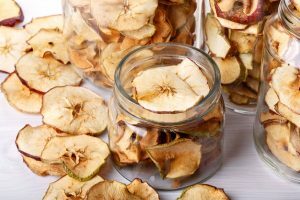 While using a dehydrator to make snacks and prep food for storage can be a lengthy process, the end result is well worth the time investment. This increasingly-common kitchen appliance is both versatile and efficient. Making healthy snacks is just the tip of the iceberg.